January of this year saw a lottery hysteria like the world had never seen as millions of players flocked to the record-setting $1.6 billion Powerball draw. Following the historic draw, millions came crashing down to reality as only three lucky players walked away with a piece of the life-changing sum. Since January, players the world over have been waiting to pounce on another epic lottery draw like the Powerball's and recapture the rush so many enjoyed only a few months ago. Fortunately, it seems that very opportunity is at hand as the US' other major lottery, the Mega Millions, began a climb towards the record books. As of Tuesday night's draw, the Mega Millions lottery had reached just over $500 million ($508 million) with no known winning tickets. That puts the draw firmly in the top ten largest lotteries in history, currently sitting at 7th all time. The United States has long been the king of major lottery draws, holding all the top world records, including January's historic jackpot. 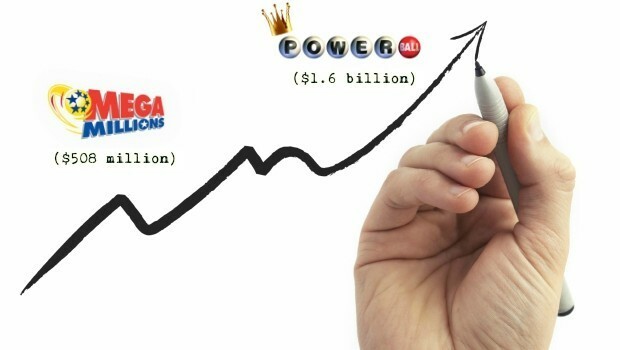 The two draws that make up all those record-setting jackpots are the US' Powerball and Mega Millions lotteries. Up until a massive rule shift within the game of Powerball in October of 2015, Mega Millions held the top two jackpot records - $656m in 2012 and $648 in 2013 - by more than $50m. Powerball's largest jackpot prior to this year was $590m. Then, the new Powerball rules resulted in January's unfathomable $1.6 billion jackpot, destroying Mega Millions' old records by more than double as well as dethroning the draw as king of the record books. Now it appears Mega Millions is back to stake claim as the world's top lottery jackpot, a feat few see possible with the record sitting at such a seemingly unreachable sum. The world-wide lottery hysteria in January of this year was like nothing seen before as the US' Powerball lottery draw reached an astronomical $1.6 billion. Thanks to a rule change that saw the jackpot odds soar from around 1 in 175,000,000 to 1 in 290,000,000, Powerball was able to build up a jackpot more than double all previously seen jackpots. This odds change is a major reason this record was possible and the main reason so many doubt Mega Millions will be able to regain its title of top record-holder without a major change in its rules as well. Three unbelievably lucky Americans walked away with the record-setting winning tickets (4-8-19-27-34-*10*) in the January draw, sending millions of hopefuls crashing back to reality as it set in they weren't taking home the life-changing sum. Thanks to the continued development of innovation in lottery, players from all over the world, not just the US, were able to take part in the historic draw using lottery concierge services and the like. Fortunately for the lottery industry, the epic dismay was met with fiery drive as now it seems players are more motivated than ever to hit a major jackpot. The United States might be home to the world's top lottery draws but don't let that discourage those non-Americans from getting excited about this $500+ million draw coming up on Friday. Thanks to the advent of online lottery play, and concierge services in particular, players from all over the world can take a shot at winning. Using concierge services like TheLotter, players can obtain a Mega Millions ticket despite not actually residing in the States. Players from across the globe should be excited to know they have a shot at the next big opportunity to take home over a half of a BILLION - that's right with "b" - dollars. Mega Millions has two weekly drawings, Tuesday and Friday at 11 pm EST, meaning the next chance to win is this Friday. To ensure you don't miss your chance at a share of this $500 million, head over to TheLotter today and buy your ticket before it's too late!